Kerry tells Russian counterpart there will be no military coordination in Syria until regime forces there allow aid into besieged cities. The United States made clear on Friday it will not set up a planned joint U.S.-Russian military coordination cell in Syria until regime forces there allow aid into besieged cities, AFP reported. U.S. Secretary of State John Kerry called Russia's Foreign Minister Sergei Lavrov and condemned "repeated and unacceptable delays of humanitarian aid," a spokesman said. A ceasefire was declared in Syria's five-year-old civil war on Monday, two days after Kerry and Lavrov signed a deal in Geneva to pressure both sides to hold their fire. It was extended by 48 hours on Thursday. Under the pact, Russia was to restrain President Bashar Al-Assad's regime while Washington leans on the rebel groups opposing him, and both sides agree violence has reduced. If the truce lasts seven days and humanitarian access is granted, Russia and the United States are to work together to target the extremist Islamic State (ISIS) and Al-Nusra front. But some clashes have continued, and the United Nations has been unable to send supplies to starving civilians in areas like the besieged northern city of Aleppo. Russia on Friday complained that only its ally, the Assad regime, is respecting the ceasefire, but nevertheless suggested that it be prolonged by a further 72 hours. Washington, however, seems to be running short of patience. 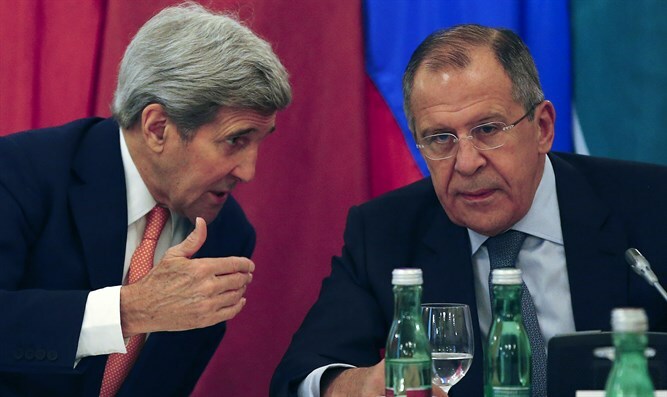 Kerry told Lavrov that Washington "expects Russia to use its influence on the Assad regime to allow UN humanitarian convoys to reach Aleppo and other areas in need. "The Secretary made clear that the United States will not establish the Joint Implementation Center with Russia unless and until the agreed terms for humanitarian access are met," he added, according to spokesman John Kirby, who was quoted by AFP.